Click on a region of the map or a link below to view a spatial inventory of projects in that region. Description: Provides basis from which future management recommendations and actions can be developed. 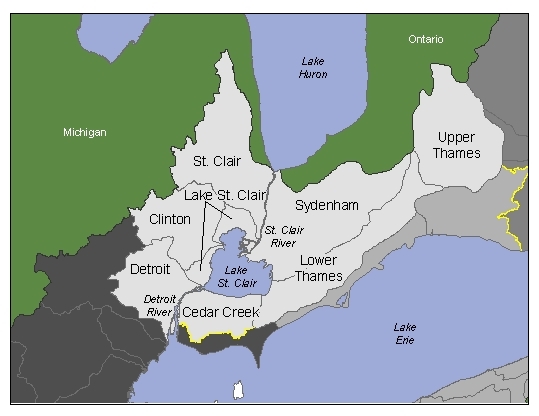 Description: This project will create a framework and design a process to systematically identify, coordinate, and implement aquatic and fish habitat restoration opportunities in the Lake Huron to Lake Erie Corridor (Huron-Erie Corridor, HEC) within a context of water level change resulting from direct anthropogenic hydromodification and/or long-term effects of global climate change. Description: Bulkhead removal and activities associated with reversing hardening of shoreline. In association with Lake St. Clair nearshore and small embayment recovery projects. Description: Assessment of landscapes, fisheries, and aquatic habitats in the river's watershed providing a comprehensive reference for all resource management applications. Description: The Great Lakes Commission, in cooperation with the U.S. National Oceanic and Atmospheric Administration (NOAA) is undertaking a project to characterize Lake St. Clair's coastal habitat and develop a restoration and conservation plan based on that characterization. The Great Lakes Commission is the principal cooperator with NOAA and will work cooperatively with various other project partners to gather data and information about Lake St. Clair coastal habitat and incorporate that information into a digital information resource. OMNR (LEMU)/ & UTRCA / LTVCA, LEMU, MNR SIRD. OMNR (Aylmer) / UTRCA, LEMU, Aylmer District, LTVCA; other potential partners include Perth, Middlesex, Oxford, & Elgin counties. Description: Initiate a Thames River Habitat Stewardship Program to provide incentives to landowners throughout the Thames River Basin to implement riparian BMPs. Focus will be on buffer strips, bank stabilization, livestock fencing, retiring fragile land. Related to Lake Erie via walleye stock contributions. Description: Over 180 barriers have been identified in the Thames River basin. These impact water quality and fish movement & migration (incl walleye which utilize lake erie). This project will assess impacts and prioritize barriers for removal. 20 key impoundments will be assessed and prioritized for mitigation or removal and a detailed plan outlining action in 2004 will be developed for 3 priority impoundments. Description: This project measures the abundance, periodicity, and habitat use of larval fishes occurring in the Detroit River. Description: This project investigates spawning habitat use by major species in the Detroit River. Work is also underway to assess feasibility of proposed habitat restoration for spawning reefs. Description: Creation of "best bets" for direction rehabilitation dollars. Michigan Sea Grant; USGS is the science leader / Smith Group JJR, Great Lakes Fishery Trust, Michigan DEQ, DTE Energy, City of Detroit, US Fish & Wildlife Service, US Coast Guard, Faust Marine Corp., Michigan DNR. Description: Three kinds of rocky substrate of representing a gradient of void space were placed on featureless, hardpan clay bottom in the upper Detroit River; monitored for spawning by lake sturgeon and other fish; and monitored for relative predation by round goby on deposited lake sturgeon eggs. Description: This project will use historical and current aquatic habitat data and modeling tools developed in an ongoing GLFC/USFWS Restoration Act-supported project to systematically identify and delineate aquatic and fish habitat restoration opportunities that protect and restore the processes responsible for creating and maintaining the pattern and function of instream, riparian nearshore, and open-water aquatic habitats within the St. Clair River and Detroit River AOC’s and Lake St. Clair. Description: Hydroacoustic surveys of rooted plant communities within L. St.Clair. Identification and mapping of habitat based on both conventional and side-scan sonar transects. Description: Habitat analysis: Availability of habitat required for spawning and surveys for juvenile sturgeon; Identification of habitat used by juvenile (<3yr) sturgeon. Description: Inventory of habitat and shoreline features to be used to direct rehabilitation targets.